When we believed that the rightwing could not let us down any further, this week their positions against the survivors of the shooting at the Marjory Stoneman Douglas High School in Florida have produced gagging and disappointment internationally. Young people who saw how one of their colleagues opened fire in the corridors of their school with a semiautomatic assault rifle - which he had free access to thanks to the permissive policy of arms in the country - decided to transform the sadness and fear into an overwhelming strength and will for the organized struggle with which they intend to change the course of things. "Since the time of our Founding Fathers and since they added the Second Amendment to the Constitution, our weapons have developed at a speed that makes me dizzy. Weapons have changed but our laws have not," said senior student Emma Gonzalez in a speech during a demonstration after the tragedy. Gonzalez, along with a large group of students, has decided to take matters into their own hands by organizing a national movement under the slogan #NeverAgain that has led directly to the Capitol stairs, demanding actions and not prayers against free access to weapons by people with psychological problems. Last Monday, the youth group decided to approach local legislative representatives to request an immediate change in national policies. "We are the ones who are making a change. We are going to talk to these politicians tomorrow and the day after. We will continue talking, we will continue to push until something is done because people are dying and this can’t keep happening," said to the media Alfonso Calderon, one of the survivors, according to the National Public Radio. Calderon, along with about a hundred other students, arrived in Tallahassee to participate in the legislative session where several Democrats tried to pass a law banning high-capacity assault rifles and loaders, but they had to see with their own eyes how the Republicans, who own the House, easily dismissed the proposal, as The Associated Press described. However, these kids seem to have a much more realistic perspective on the matter. For Melissa Camilo, one of the survivors of 15 years, "all this could have been prevented if people were doing their job," she said referring to lawmakers. "And the fact that we young people have to start acting like adults and start doing their job, it's really sad that we have to take action when these people have studied all their lives to do a job that they are not doing," said Camilo, according to the Tallahassee Democrat. Still, for the supporters of the American right, the issue is ridiculous and even laughable. 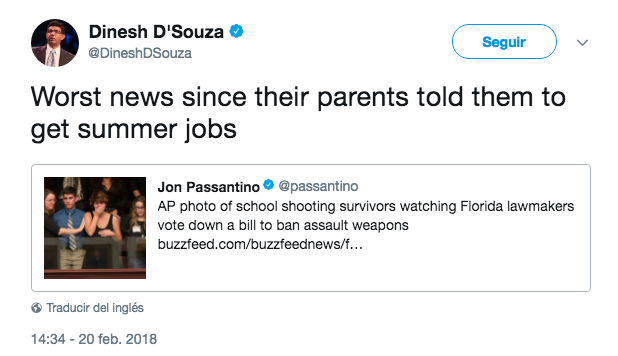 The author and public figure, Dinesh D'Souza - known for his publications against progressive politics in the United States - wrote through his Twitter account that the dismissal of the bill in Tallahassee was "the worst news (the kids have received) since parents told them to get summer jobs," as if hiding in a closet to avoid being shot was an everyday affair. Similarly, a state legislative assistant, Benjamin Kelly, wrote: "both young people in the photo (speaking of Gonzalez and his partner, David Hogg) are not students but actors who travel to various crises when they happen". This conspiracy theory cost Kelly the job and a wave of rejection that intensified through social networks. The attack against these young people (and against anyone who supports them) has varied in rank, from those who consider the support of the "liberals" to the cause a matter of hypocrisy (as conservative activist Jack Kinston did) to those who claim that everything is a Democratic set-up to get the votes this year. So much disbelief and cynicism does nothing but show that, in a country where school massacres have become a tradition, the strength of the victims is a nonexistent phenomenon, almost a myth. But there is a larger and vaster society that continues to believe in what is just, and that has decided to place its hopes on these hundreds of young people who will undoubtedly change everyone’s life.